On The GO! | Run, Lindsay, Run! Quick trips like that often throw me for a loop as I don’t really get to settle into a routine or plan things out as I’d like. I thought it would be helpful to share some tips for keeping your healthy routine while traveling- I’m certainly not an expert but hope I can share with you! Plan, if you can. I knew I wouldn’t have much down time this trip, so I scheduled two rest days into my schedule for Sunday and Monday. It meant putting in a few extra miles last week in preparation, but your schedule doesn’t need to be too disrupted with some pre-planning. But remain flexible! I am a planner, as I just mentioned, but I am also trying to remain more flexible. It’s just as important to remember that squeezing in 3 miles instead of a planned 8 miler is better than nothing! Do what you can, with what you have. Get out and explore! 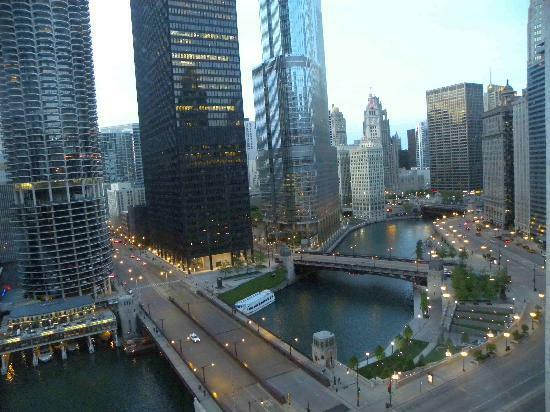 If you are fortunate enough to have down-time, or can wake up a bit earlier to get in a morning run before your day’s activities begin, there is no better way than to see your destination city than by fleeted foot! Many hotels will have local maps, or pre-mapped running routes, that you can use to set your route so you don’t get lost. Mapmyrun.com is another great resource, you can even look at routes other users have uploaded in the area. I like to write the route in sharpie on my hand, or on a post-it stuck in my shorts.I did a post a while back about why I love to run when I’m traveling. Pack snacks from home: If you know you’ll be rushing to your gate without time to eat pre-flight, or have a long flight ahead of you, it’s okay to pack some snacks from home. Just make sure they’re easily portable and won’t go bad– like a hard apple vs. a soft banana! Granola bars, crackers, carrot sticks, and nuts are all great carry-on snacks, but you could also pack a PB&J sandwich just as easily! Choose healthier options at the airport: Chilis-To-Go. Wolfgang Puck. McDonalds. All these sit down or t0-go choices at the airport sound appetizing, but eating greasy or heavy food bef0re a flight will just make your energy levels dip, and the high sodium contents can leave you more even more dehydrated. Most major airports now have healthy kiosks like Jamba Juice, SaladWorks, or markets like Cibo where you can grab and go. When I got to the airport at 5:30am on Sunday morning, I ate a delicious serving of cooked oatmeal from Au Bon Pain and topped it with dried cranberries and chopped in a banana- SO much better than a sugary muffin or pastry. When I flew out on Monday night around dinner, I went to Salad Works and made a DIY salad with arugula, avocado, egg whites, tomatoes, broccoli, carrots and walnuts. Yum! Even Starbucks has to-go breakfast and lunch options that are a bit healthier than your average fare, if you chose right. Start with a healthy breakfast. I find starting my day with a healthy and filling breakfast sets a healthy tone for the rest of my day. This past weekend, I found myself short of time in the morning before I had to go to the trade show, and didn’t want to go to the hotel breakfast restaurant because it was sit-down. I seriously considered ordering room service (expense that!) to make it easier but all of the options were way overpriced and a bit much food. Since I was in a major city (Chicago), I went to the Walgreens on the same block as my hotel and grabbed a protein shake and a fresh fruit salad. I knew the protein would keep me full and energized as I stood on my feet all day, and I could drink it quickly (along with my morning coffee, of course) in the car on the way to the trade show. Well, that’s about all I’ve got. I hope you found some of these helpful next time you hit the road! Traveling can be hectic, but there are always healthier options and ways you can squeeze in some fitness if you make it a priority! I’ll leave you with my easy lunch from today. Apologies for the crappy camera phone quality, I forgot my real camera at home. Heat the black beans and fire roasted veggies in the microwave for a few minutes, until hot. 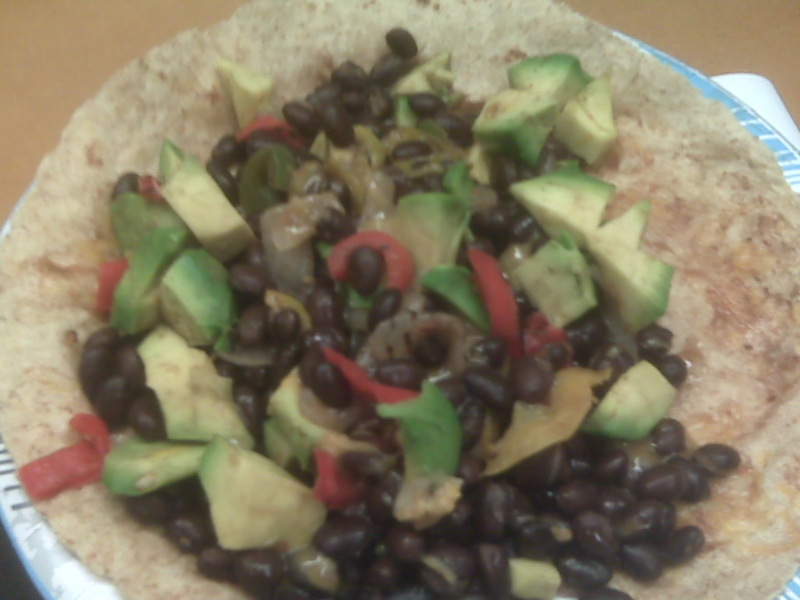 Place beans/veggies on whole wheat tortilla, add chopped avocado, sprinkle with cheese, and enjoy! What do you do to get in your exercise and still eat healthy while traveling? Do you find it hard to stick to your routine when on-the-go? Those are great exercise and eating ideas for traveling! My strategy when I’m traveling is usually to wake up really early to either run or use the hotel gym, so I don’t feel like I’m missing out on anything later in the day. But I also sometimes just forgo the “traditional” exercise if I know I will be walking around all day. I love the idea of doing crunches, pushups, lunges, yoga, etc. in the hotel room. I think I would need to write down my plan on a piece of paper first so that I would actually follow through with it. Glad you had a good and healthy trip!! GIRL THAT LOOKS AMAZING!!! I want your mexican wrap right now!!! GREAT TIPS….I will be printing these out for the next time I travel!! It sounds like you did a great job staying healthy while traveling – good tips. I often fall into the trap of eating what “sounds good” while on the go. Burgers, sugar-y muffins, and coffee drinks give me a quick burst of energy, but I always feel like crap at the end of a long travel day. I love make your own salad places – perfect plane food! Great tips! I try my hardest to get at least a quick workout in first thing in the morning and bring a boatload of snacks. From One Suitcase, To Another « Run, Lindsay, Run!